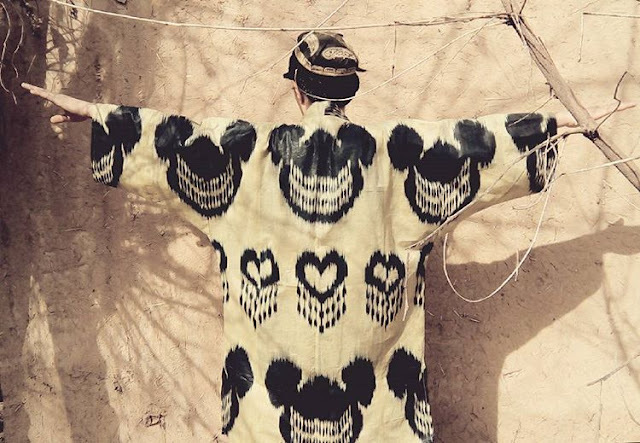 Meet the incredibly talented and innovative Uzbek textile designer and artist Dilyara Kaipova. 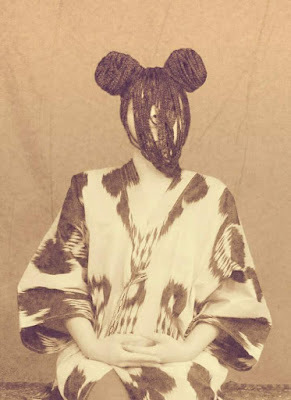 After graduating from the design faculty of Tashkent's Republican Art School named after Pavel Benkov, Kaipova worked as a designer at the Muqimiy Musical Theatre in Tashkent. That was followed by a stint as master of hand puppets at the Uzbekistan State Institute of Arts and Culture. However, since childhood she has been fascinated by needlework, knitting and embroidery. 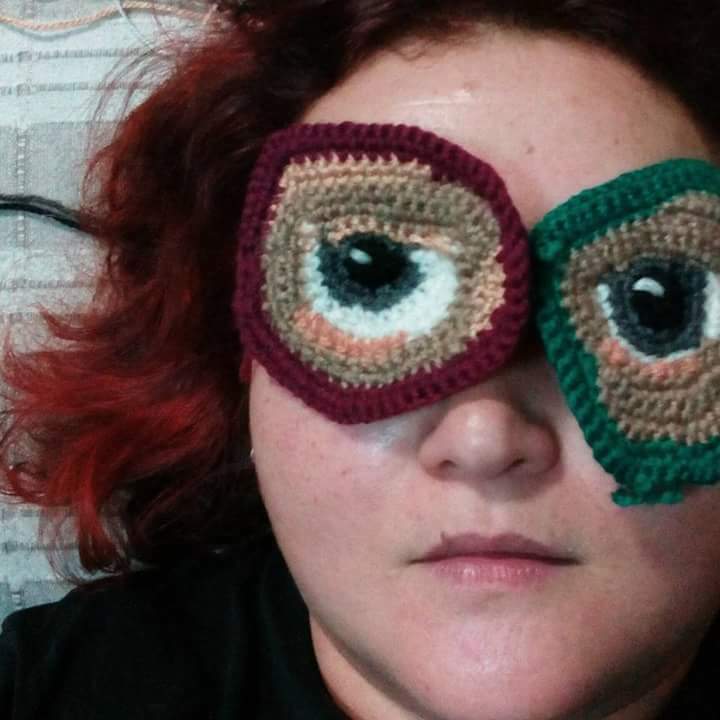 As these practices seeped into contemporary art, much of the focus of her creative activity shifted from painting (usually in soft pastels) to textiles. 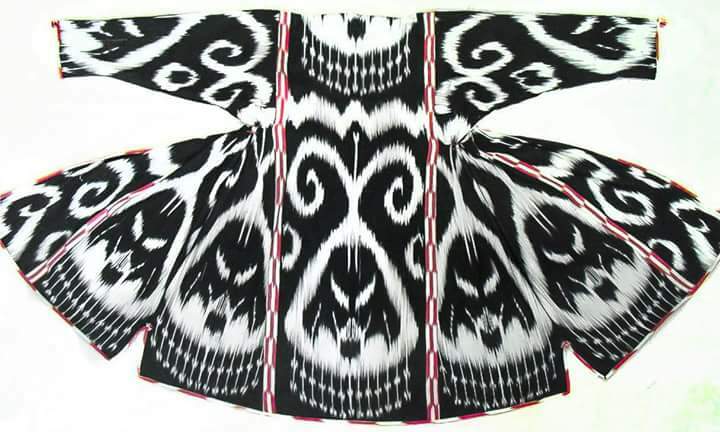 Her first textile project "Captain Ikat" explored how traditional arts - in this case ikat fabric - can absorb and be devalued by symbols and cliches of mass culture. Yet the paradox is that these same cliches can also invigorate and transform national traditions. The fabric, even when woven with designs of Mickey Mouse or Batman, magically still came alive. As Kaipova commented:"I think it's a big mistake to try to "fossilize" traditions, as it's impossible to change the course of history, they evolve independently of us, of our influence." 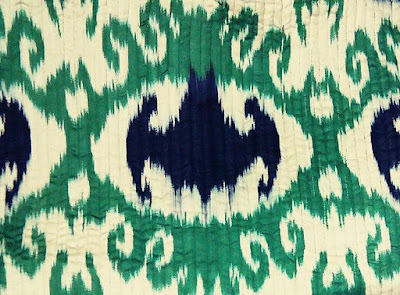 She also noted that since childhood she had wanted to understand what "embroidery and ikat ornamentation symbolised and, simultaneously, I wanted to interfere with it, to change it". Working with masters in the ikat weaving centre of Margilan, in eastern Uzbekistan over five months, Kaipova produced classical, hand-woven adras fabrics (silk and cotton mix) infused with Mickey Mouse, The Scream, Batman and Darth Vader. 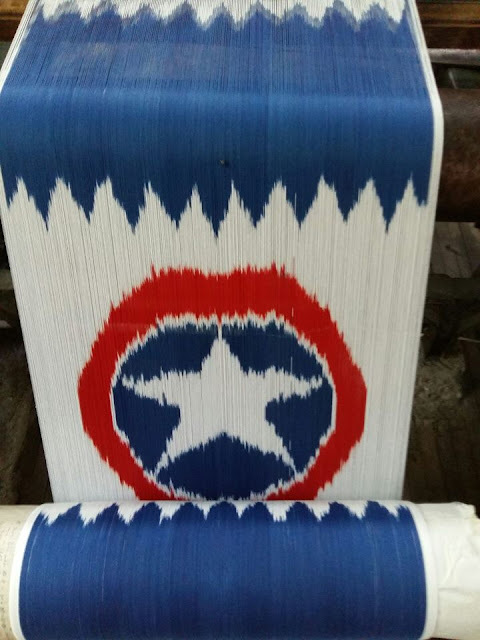 Fabric was also produced with a Stars and Stripes motif. Kaipova laughed, with respect, that although those masters thought she was totally crazy, they worked enthusiastically with her, creating these magical works. The "Captain Ikat" exhibition was held in Tashkent in October 2016. Reactions were varied - from enthusiastic delight through bewilderment and shock. For Kaipova it was the realization of her "childhood desire" and she described the happiness she experienced through the project. 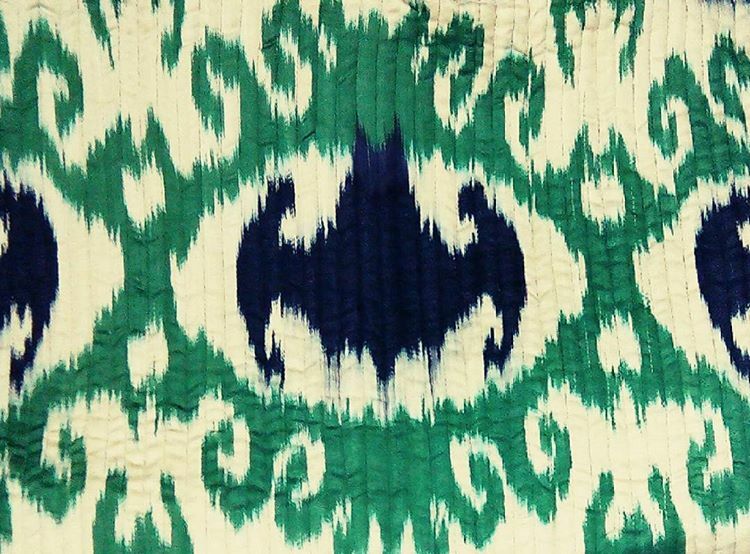 Edvard Munch's The Scream woven into ikat fabric. In April 2017 Kaipova participated in a contemporary art exhibition/competition in Bishkek, Kyrgyzstan. Her works included some of these ikat fabrics as well as photographs, another artistic direction she pursues with passion. She won first prize. Now she is preparing for a solo exhibition at the National Gallery of Uzbekistan in November. The exhibition's theme is not yet determined. 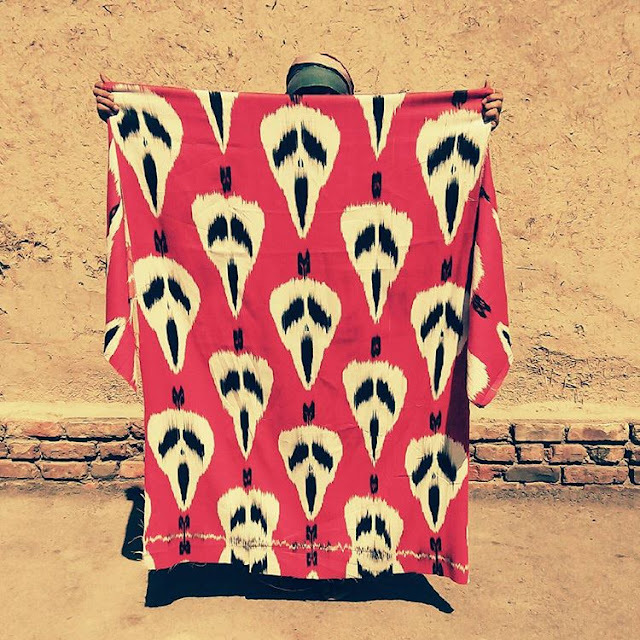 Kaipova feels that, although ikat is always in her heart, for the moment she has exhausted this theme of globalization, consumerism and tradition. However, Uzbek traditional textiles present inexhaustible ideas for her work. Collaboration is at the heart of Kaipova's practice and she now would like to work with fashion and interior designers. This is how the BBC wrote of her paintings in an interview: "her favorite art medium is soft pastels. 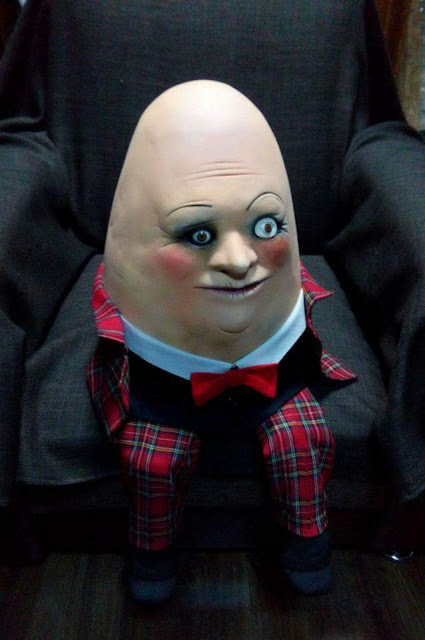 Dilyara’s subjects come straight from her imagination, and her subject matter can be simultaneously hilarious and scary. Her imagery of invented characters that look like "freaks" or little monsters is the artist’s chosen motifs to comment on the hopeless and ridiculous aspects of human existence. 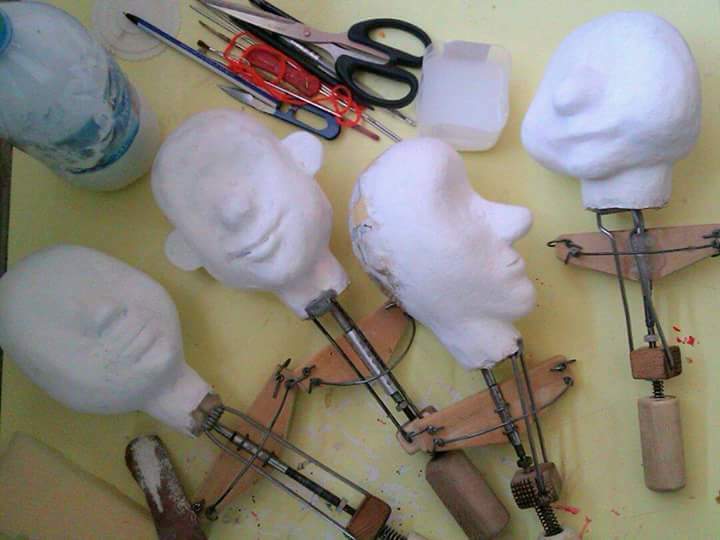 She fills her world with "puppet Lolitas’" where their expressions conceal and reveal purity and decay, cuteness and ugliness". Dilyara Kaipova's work is available for purchase and she works on special commissions. Please see below for more images of this multi-talented artist. Sally Clarke, of Asian Art Advisory, provided helpful inputs into Dilyara Kaipova's work. 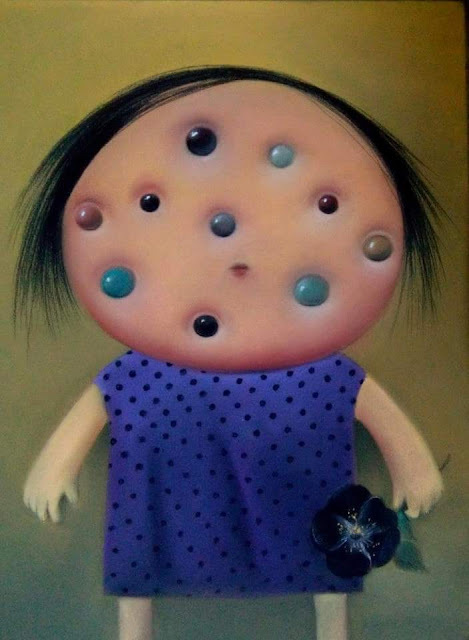 Uzbek Journeys will report on Kaipova's end-of-year solo exhibition.